With cities growing in terms of their population size and jurisdiction, metropolitan governance is taking new forms which are shaped by the political environment, economic reforms and globalization effects. One such form of governance is seen in Mumbai through its powerful parastatal agency called the Mumbai Metropolitan Regional Development Authority (MMRDA). MMRDA was born as a result of the political clout between the state and the local government, as each wanted to gain powers in the city of Mumbai, India’s financial capital. Soon, MMRDA over powered the local government and other institutions in the metropolitan region, especially in the Mumbai city, as it received the necessary political backing from the state government and benefitted from its organizational structure that guaranteed it the freedom from political interference and thus allowed quick decision making. Today, MMRDA stands as an ideal institution for the promotion of neo-liberal planning agenda, but its presence has violated the Decentralization Act of the Constitution of India and Town Planning Act of the State of Maharashtra, both of which ask for decentralization of governance and planning. Mumbai, the city of dreams, has always been special to me on account of the diversity in the built spaces that it offers. Be it the over-crowded local trains or the mesmerizing architecture of South Mumbai or the posh localities of the central Mumbai or the shopping experience in Dharavi, Asia’s largest slum settlement, every encounter with city adds to the multitude of experiences. I became academically associated with the city after I choose to do my masters dissertation on the governance of the city which started with the quest to answer a simple question – “Who governs the Mumbai metropolitan area and how?” With every attempt to gather information, one name popped up again and again: “The Mumbai Metropolitan Regional Development Authority (MMRDA)”. The Mumbai Metropolitan Region (MMR) is spread over an area of 4355 km2 and comprises of 8 municipal corporations, 9 municipal councils and more than 1000 villages. There are a number of agencies that operate in the city, thus, creating a polycentric governance structure. But one key agency that over powers all of them is the MMRDA. MMRDA was formed in 1975 as per the Mumbai Metropolitan Regional Development Act, 1974, as a parastatal agency. As per the Act, the main objective of MMRDA is to secure development in MMR and for that purpose the functions of the Authority are planning, execution, formulation and financing of various projects. 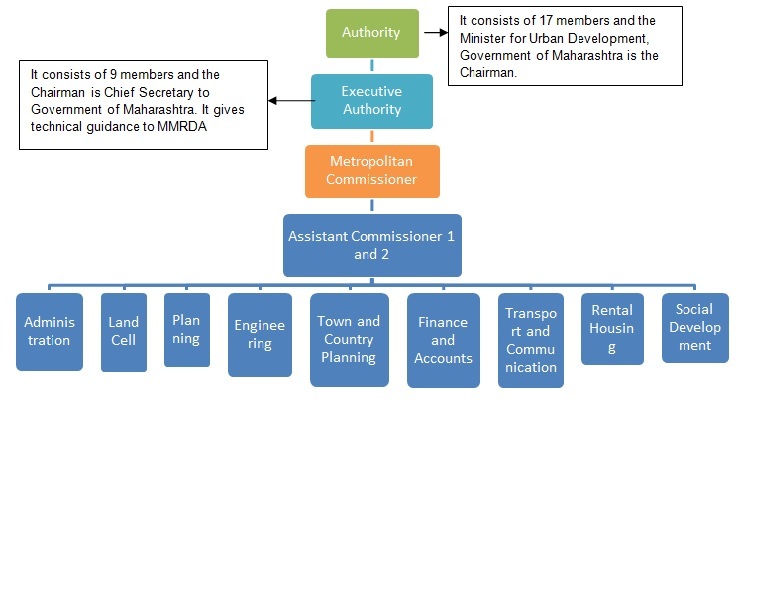 The organizational structure of MMRDA is such that it is headed by the state urban development minister and is largely composed of bureaucrats. The composition of the organization is such that it has great technical expertise and is an expert controlled body, unlike other institutions in Mumbai. 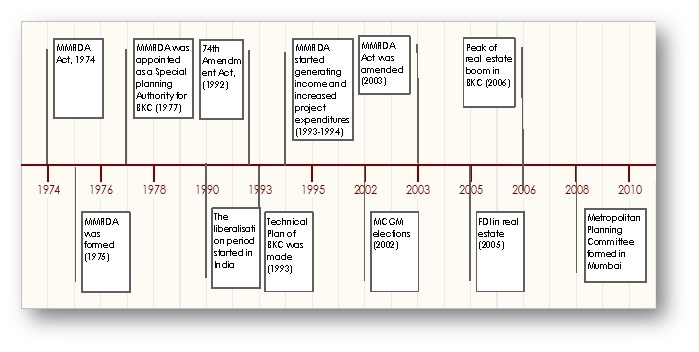 The intent behind the formation of MMRDA was a political game. During those days, two different political parties were present at the local (Shiv Sena) and the state level (Congress). The local government in Mumbai did not want any kind of interference within their jurisdiction and hence the MMRDA Act allowed MMRDA to operate in all areas except the jurisdiction of Municipal Corporation of Greater Mumbai (MCGM) where the Shiv Sena government operated. By 2003, MMRDA had accumulated huge financial clout on account of its Bandra Kurla Complex Project for which it was the special planning authority. MMRDA raised huge money by land leasing activity in this project and the Congress government decided to clip the wings of the Shiv Sena government by amending the MMRDA Act in 2003 which enabled MMRDA to operate within the jurisdiction of MCGM. The amendment gave the Metropolitan Commissioner, who is also the CEO of MMRDA, the powers of the Municipal Commissioner. The Act also gave the Authority the powers to make revisions in the regional plan and also undertake modifications and revisions in the development plan of city. Thus, the Act allowed MMRDA to surpass the rules of Maharashtra Regional and Town Planning Act (MRTP), 1966 which eventually led to its encroachment in the city planning process. Thereafter, MMRDA accumulated great powers to operate within MCGM and was successful in conquering the city of Mumbai, India’s financial capital. Over the years, MMRDA has extended its domain of functions by undertaking projects that were handled earlier by other institutions in Mumbai like MHADA (Maharashtra Housing and State Development Authority), SRA (Slum Rehabilitation Authority), MSRDC (Maharashtra State Road Development Corporation) and MCGM (Municipal Corporation of Greater Mumbai- the elected local government). The reason for MMRDA being able to overpower these organizations lies in its structural capabilities, which has allowed it to make decision making process fast and void of political interference. Though MMRDA was created through an act of Legislature, it is not accountable to the legislature but to its Board which is headed by the state urban development minister, experts, bureaucrats and local government representatives. Its financial structure has used legal instruments like land leasing, transfer of development rights, betterment levies and development charges to raise enormous amounts of revenues in a short span of time. The balance sheet of MMRDA also shows that it disburses loans to all other institutions in MMR and earns through interest on these loans (second most important source of revenue for MMRDA). And most importantly, the structure has been open to the flow of international capital which requires a stable environment and faster decision making processes in place. Let us now look at the timelines during which major changes took place and how MMRDA made decisions, strategically, to benefit from these changes. The phase of decentralization in India started with the 74th Amendment to the Constitution in 1992 which showed the pathway to empower local governments, politically and financially. The Act did have some loopholes but it was commendable as it laid the necessary guidelines to govern small towns, cities and metros. So what did the Act say for metropolitan regions? Every metropolitan region shall constitute a Metropolitan Planning Committee (MPC) which has not less than two-thirds of its members who are elected officials. The MPC will be responsible for preparing the draft development plan, coordinating between the local bodies in the metropolitan area, allocation of resources made available by the central and state government for local bodies and solving of conflicts. In Mumbai, MPC was formed in 2008 after repeated prodding by the civil society and its office lies within the MMRDA office. But since then, it has remained notional with no activity at all. The MPC has had only three-four meetings till date and continues to be an entity governed by the MMRDA. The period of 1990s (1991 precisely) was also the era of liberalization where India opened its gates for a market oriented economy. During the same period, MMRDA devised its plan for its Bandra Kurla Complex project and thereafter raised enormous amounts of revenues. Taking advantage of the boom in the real estate market in 2005, MMRDA further accumulated wealth and extended its functions, powers and responsibilities. Clearly, the time period between 1990 and 1992 saw exactly conflicting situations wherein India took steps towards decentralization of governance and on the other hand Mumbai’s MMRDA became a powerful institution, thus, centralizing decision making processes in the city. Truly speaking, MMRDA is an organization with immense capabilities and it was rightly structured in the age of liberalization and globalization. However, the state has created a new form of centralized governance by tweaking the laws and also notwithstanding the Constitution of India. As Indian cities are approaching towards a highly competitive globalised economy, I believe, that institutions like MMRDA will soon be replicated and decentralization will find no place in our mega cities. Pooja is an Engineer turned urban policy practitioner. Currently working as the Project Coordinator- Urban Governance at Janwani, a Pune based NGO working with the support of Mahr atta Chamber of Commerce, Industries and Agriculture (MCCIA). She has completed her MSc in Urban Policy and Governance from Tata Institute of Social Sciences, Mumbai. Interest Areas: Urban studies, Open Budgets. This entry was posted in Beyond planning and tagged decision-making process, governance, India, metropolitan areas, Mumbai, spatial planning, strategic planning. Bookmark the permalink. The malfunctioning of the MMRDA is a tragedy. Mumbai is sinking and flooding. Growth now needs to be on the main land and away from the coast. By the way, a new study has said that in 50 years sea level may rise by 10 feet!